The long and bumpy story of XTC, one of my favorite bands, is certainly filled with drama. 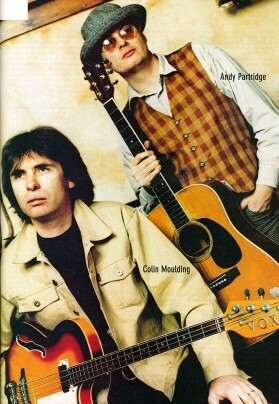 Most of it hinges on the immense talent and immense self-destructive streak running through Andy Partridge, who suffered a nervous breakdown from overwork in 1982 and refused to tour afterwards. The band confined itself to the studio and continued to turn out great (probably a lot of its best) material, but endless fights with management and their-then Virgin record label ground them down, all without concert gate to make it up. Tensions within the band grew over the lack of commercial recognition, despite a seemingly endless period on the cusp of such a breakthrough around the time of hit singles Dear God and The Mayor Of Simpleton. An EXCELLENT journey through all of this can be found in XTC: Songs & Stories, which gives accounts on the background of every XTC song and also a very revealing look inside the studio battles that Andy always seemed to win – and little by little, we can see almost a subconscious desire by Partridge to sabotage the greater possibilities of success for the band, as if he’s avoiding the same path of quickly rising and mega-touring that led to his 1982 breakdown (which was supposedly also attributable to his then wife throwing out his valium – Partridge’s domestic problems and joys also figure heavily into his music). In any event, XTC put out a shelf load of material during their time together, all of which is wonderfully catalogued & OCD’d over at the wonderful Chalkhills fan site maintained by John Relph. And in keeping with my own OCD, I have finished listening to the must-have-for-fans Fuzzy Warbles Collection, nine CDs worth of home recordings from Partridge from over the years, including demos of songs eventually recorded, songs eventually given up on & thrown away, and assorted fragments & ephemera. This collection is a rich & wonderful assortment of the wide gamut of musical stylings that XTC produced over the years – from their rough/industrial/clangy sound through softer, often Brian Wilson-esque material, through their knock-offs of psychadelia and bubblegum, and through an assortment of ear candy from some of the best Brit poprock of the past thirty years. I’m interested in listening to the demo versions of slickly produced songs Partridge originally recorded in his garden shed, since it provides a window into the actual process of putting a record together, a subject that the Songs & Stories book tackles very well, and can also be glimpsed in the wonderful Chuck Berry documentary Hail Hail Rock & Roll by Taylor Hackford. Sometimes lyrics get changed, bridges get re-arranged, songs are restructured, and so forth. It’s basically the rock and roll version of comparing the early & revised versions of symphonies. But what mystifies me when listening to a lot of this material is just how damn good the songs they threw away are. I remember someone reviewing a previously released collection of forgotten XTC B-sides Rag & Bone Buffet remarked “The songs these guys throw away are better than some bands’ careers.” I heartily concur, especially now that I’ve heard a boatload of material Partridge gave up on for whatever reason and wonder why. Partridge’s commentary on this material can be found here, and while it provides some insight into this, I guess there’s really no way to truly explain artistic temperament, especially with someone as volatile as Partridge. Listening to all of this material, however, makes me wonder if Andy is done cleaning out his mental closet. There always seems to be news of new recordings in the works (most recently with Robyn Hitchcock) that never seem to materialize. With the present day technologies allowing him to record, mix & distribute his music without the money boys or record company weasels intervening, I’m hoping that someone who has been as prolific in the past as Partridge has been will continue to pump out top-notch material, with the clever lyrics and mix of musical styles to fit the idea behind each song. My eager ears await more!